Road map of Karpathos, including the nearby islands of Kasos and Saria, with relief shading indicating the terrain. The map shows various types of vegetation on the island and highlights beaches and main places of interest. A street plan of the town of Karpathos shows hotels, restaurants and bars, shops, etc. 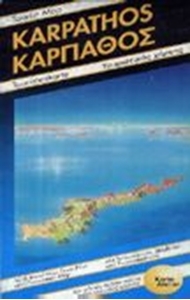 On the reverse, there is a panorama map of the islands and the rest of the Aegean.